Have you ever wanted to do a parachute jump? 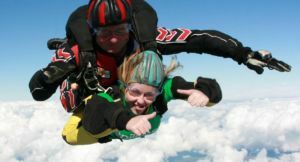 Well, here is your chance to do an exhilarating jump for charity! All training is given on the day, so you just need to book and turn up and jump! There are different companies you can use to book your jump see below – or want to jump at your local centre not covered by these? Just ask them if its possible and get in touch! No experience is necessary as all training is given. So if you would like to make a thrilling tandem skydive from 10,000 feet get in touch! We ask you to raise a minimum amount of sponsorship money, and if you raise enough you jump at no cost to yourself! Check each page to see the minimum sponsorship for each jump – in addition to the minimum, every extra pound that you raise comes straight to the charity, so please try to raise as much as you possibly can! 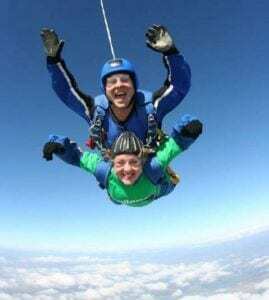 These companies specialise in organising parachute jumps for charities so if you have any questions about the jump itself or locations, please ring them directly as they are in the best position to answer your questions! Do contact Jo in the Fundraising Office if you have any questions about fundraising or what to do once you’ve booked! It truly is the experience of a lifetime!! You can help! Every pound raised by you will increase the amount of research we can fund. For any additional information email Jo or call 020 3096 7887.